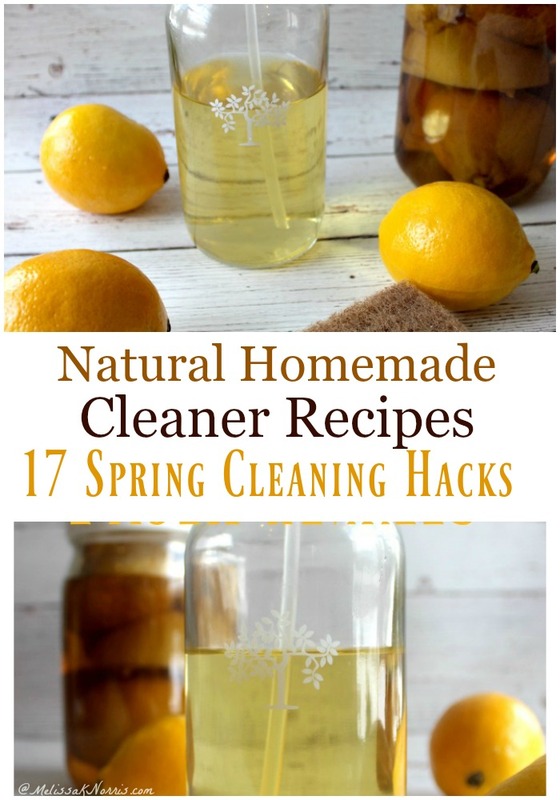 Natural homemade cleaner recipes with 17 spring cleaning hacks done up pioneer style, because that’s how we roll around here. My homesteaders heart loves spring, from the longer hours of daylight to the first bits of green poking their heads from the snow packed and dark brown earth. Sunshine comes back to play and when it does, it’s showing you the streaks on the window or the dust on the tables that managed to somehow hide during the darker days of winter. Please tell me it’s not just my house? Listen below to Episode #137 of the Pioneering Today Podcast,where we teach families how to grow, preserve and cook their own food using old-fashioned skill sets and wisdom to create a natural self-sufficient home, with, or without, the homestead. When we look back on the history of spring cleaning, it was in a time when there were no vacuums, dryers, or electricity. Homes were heated with wood or coal and lit with kerosene lanterns and candles. In other woods, there was some soot, dust, and a bit of smoke to clean off and out of the house. While I’m grateful I’m not dragging all of my rugs outside to beat them with a stick, yes my trusty vacuum cleaner you are amazing, there is still a bit of spring cleaning to tackle when the days turn warmer. One of the drawbacks in our modern world is when using conventional or modern cleaners, we’re actually making our home worse with harsh chemicals. Like the pioneers of old, I prefer to use natural homemade recipes and remedies to keep my home clean and sparkling. Below you’ll find many of the homemade cleaners that actually work that I use in our home. I love glass spray bottles, especially when using acidic things like vinegar. Here’s a great deal on glass spray bottles! And unlike the pioneers of old, most of us don’t have a full week at home to dedicate to spring cleaning. I break mine down into weekly tasks, fitting them in when and where I can. Clean out the cleaner cupboard. Get rid of almost empty bottles or cleaners that didn’t get the job done but you’re holding onto. I’d say toss anything with harsh chemicals, but that’s up to you. I prefer to use homemade cleaning products recipes (you’ll find them below). To look up the ingredients and their safety profile, I use the Skin Deep Website. You’ll notice in my spring cleaning I start at the top of the room. Dust cobwebs from the ceiling or top of the walls and then start remove and wash your curtains. You may decide to do this by room or by item, where you do all the curtains in one day, all the bedspreads another, etc. Whichever works for you. I prefer to wait for a sunny day so I can line dry all of my curtains and bedding outdoors. My spring cleaning starts with all of the blankets and bed spreads and/or quilts so they can dry on the line. I do this twice a year (unless an emergency during the winter and/or summer months) in the spring and fall. You can’t get a more natural spring clean than fresh sunshine on your fabric. I have my great-grandmother’s chenille bedspread and will only dry in on the line. Same thing with my heavy winter quilts. The last thing I clean is the floor, so all of the dust and dirt we’ve dislodged and moved around gets cleaned up. Clear off the counters. Chances are, some things have made their way on to the counter that don’t belong there. Take a minute to return them to their home and see if there’s anything that you can get rid of or find a new spot for to clear up some counter space. Give the counters a good spray and wipe down with your diy all purpose cleaner. This natural multi purpose cleaner recipe and many other homemade natural cleaner recipes can be found in my book, The Made-from-Scratch Life: Simple Ways to Create a Natural Home! Wash the curtains. My husband and I occasionally come to a stand off on certain things. I want a home filled with more natural substances and he wants his laundry to smell like scented fabric softener and dryer sheets. Even though I frequently make my own laundry detergent and use vinegar in the rinse cycle, he wants the scented stuff. I’ve learned to give when I can, because he will go out and purchase it if I don’t, which means I have no say on the brand or what’s in it. In the spirit of comprise I’ve been using Mrs. Meyer’s Clean Day Lemon Verbena Fabric Softener. It’s made without Parabens, Phthalates, animal derived ingredients or formaldehyde. And it smells good, which is key in this battle friends. Yep, it’s been part of my Grove Collaborative order every other month. Update: I’m thrilled to announce I found these organic wool dryer balls to use in place of fabric softeners. Never used wool dryer balls before? They shorten the amount of time you use the dryer. They help keep fabric soft without the use of any chemicals or other substances. These are my 3 favorite essential oils to use with cleaning, laundry, and in our natural medicine cabinet from my favorite essential oil company Plant Therapy (because they have their oils tested by a third party lab for purity with the results on the page of the oil and they have listed whether or not it’s a safe for oil to use with children). Here’s my top 3 in one kit. I also tried using a different brand of essential oil first, and it didn’t leave any scent on the clothes. The lavender and peppermint definitely leave a scent and I use the lemon in a lot of my cleaning products too. Grab them all here in this fun little wooden box set! Wash the windows. I do the insides first. Here in the Pacific Northwest, the sun still plays peek-a-boo so I go the for sure thing first. The outside windows all get done on one day. I use my homemade all-purpose citrus cleaner for this. Clean out the microwave. We try to keep our use of the microwave at a minimum, but I ain’t gonna lie, we still do use it. Fill a glass bowl with water and a few slices of lemon. Microwave for about 3 minutes so the water boils, then let the steam sit in the microwave for another 5 minutes. The steam will loosen gunk and food so you can easily wipe it away with a sponge! Sink drains. Pour 1/8 to 1/4 cup of baking soda down your drain. Follow it with a chaser of vinegar. I pour until it reaches a good foam, allow it to foam for a few seconds, and chase it again with more vinegar. Let your drain sit for about 10 to 15 minutes. Pour a cup of boiling water down the drain. For an especially clogged drain, repeat. I do this every other month or so to keep pipes clear. Wash any removable covers on pillows and couch cushions along with any throws or blankets. Try this DIY fabric spray for non-washable surfaces (dude, do a test area first if you’re worried about the fabric): 1 tablespoon of baking soda, 5-10 drops of essential oil, and water in your Grove Collaborative spray bottle. Carpets have a way of getting dirty… even with the no shoe rule, which means we must have a rule breaker in our home. Try this natural homemade spot carpet cleaner: Mix one tablespoon of Mrs. Meyer’s dish soap into a cup of hot water. Dip a white rag into the solutions and blot it into the stain. I used this on the upholstery in our car.… I found my daughter had spilled her hot chocolate in the back seat under her booster seat four weeks ago (and now I know why I kept smelling sour milk but couldn’t discover the source, ahem). It took up the soured milk and chocolate and left the car smelling wonderfully. Seriously, I can’t believe how great of a spot cleaner this was! Freshen the carpets. Use this homemade baking soda carpet cleaner recipe. Mix a cup of baking soda with about 15 drops of your favorite essential oil. Sprinkle onto carpet, let sit for 15 minutes and then vacuum. Drapes, curtains, and blinds all need a scrub down. You may wish to do blinds a different day from curtains or drapes. Dust all of the tables, shelves, and knick knacks. Who knew all the homemade cleaners with vinegar you could use or replace! Faucets.Wet a towel in vinegar. Wrap it around the faucet and handles and let sit for a half hour… or until you walk back in the room and remember you were cleaning, whichever comes first. Come back and wipe clean. Hard water stains and gunk will be gone. Shower and bath tub. I use baking soda to scrub the bottom of our shower and the tracks of our shower door. After rinsing off the baking soda, I spray all the surfaces with my vinegar rinse. I let it sit for a few minutes and then wipe clean. Sinks. Sprinkle 1/8 cup baking soda into your sink. Mix with a small amount of water to make a paste and scour the sink. It eliminates odor and rubs off stains. Rinse clean with warm water. Toilets. Dump a ½ cup of baking soda into the toilet bowl. Let it sit for about fifteen minutes. Scrub with brush. This takes away any odor and scours off anything undesirable. Spray toilet seat, handle, and base with the homemade all-purpose citrus cleaner and wipe clean. To get your kit, sign up for Grove Collaborative here and the offer will be automatically added to your cart. You’ll answer 4 quick questions about your current cleaning routine, which Grove will use to recommend products for your first basket. You can customize your order by adding or remove items — as long as your order is a minimum of $20, you’ll qualify for the offer. My Grove VIP membership helps me save even more with free shipping, price matching, exclusive sales, and free full-size gifts. I highly recommend taking advantage of the free shipping and personal service that comes with this membership so you can see if it’s right for you! Best thing is, they email or text you a few days before your order comes up, so you can swap items out or even put it on hold until the next month if you don’t need anything. I’ve actually put mine on hold for 3 months before. I love the reminders so I’m not taken by surprise. Ready to get started on your spring cleaning and streamline your household shopping routine? Sign up for Grove Collaborative here . You will receive the Mrs. Meyers Spring Cleaning Kit for free when you sign up! There you have it, my favorite homemade cleaner recipes made with natural ingredients for all your spring cleaning!